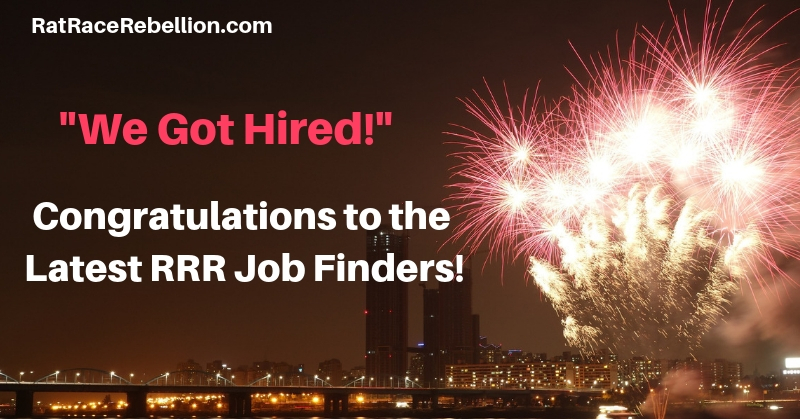 “We Got Hired!” – Congratulations to the Latest RRR Job Finders! Please join us in congratulating the latest group of RRR job finders! And thank you again for emailing us and posting your wonderful news on our Facebook page! Your messages totally make our day!!!! Thank you so much for the referrals, too — and the pats on the back! We’ve excerpted some of your messages below. “Hi! Just wanted to say thank you for all your postings and let you know that I got hired at Amazon to work from home pt @$15/hour!” – Adriana C.
“Hi! Just letting you know that I was hired by ExecOnline as a part-time Student Retention Specialist and I start tomorrow!!! Thank you for including them in your email!!!! – Janelle K.
For screened work from home jobs & side gigs, see our Newest Jobs & Gigs page. To be the first to hear about jobs & gigs, follow our Facebook page and select “See First” in the dropdown menu under “Follow.” May you be in our next “We Got Hired!” post!